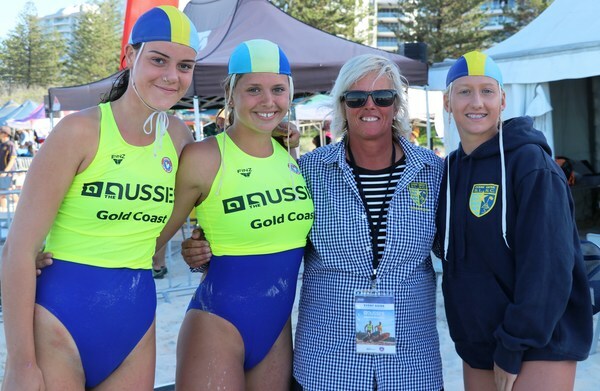 Piper McNaughton, Jemima Asher, coach Sonia Kinsey and Milla O''Brien after coming 3rd in the U15 board relay at the Aussies. Ocean Grove Surf Life Saving Club acquitted itself brilliantly at the Aussies in Queensland last week. Ocean Grove produced some stunning results at the prestigious surf life saving carnival. The stand out competitor for Ocean Grove was Milla O’Brien who made three finals – individual swim, board and iron. The club also made several team finals including Under 19 boys ski relay, Under 17 girls ski relay, Under 17 girls ski relay, Under 17 girls and boys relays and the swim teams girls Under 17 finals. Cam Bohan finished 10th in the final of the Under 19 single ski and Jesse Coulson made the Under 19 swim final. 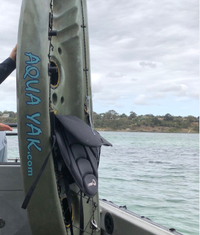 “For Cam Bohan to make a ski final in the under 19 was extremely pleasing and he has managed to combine study, work and training well this season having finished year 12 back in November,” OGSLSC coach Sonia Kinsey. Kira Kinsey, a former OGSLSC team member and Victorian representative, finished top 10 in the open women’s iron final on Sunday. Kira moved north from Ocean Grove and also made the board final, a fine achievement in the open women’s field. Ocean Grove’s Under 15 girls made the final in the board relay and the Cameron relay. “Our Under 15s were up there all weekend – it was very good to see the hard work over the summer has paid off and while we have room for lots of improvement, we were up there against the best in Australia,” Kinsey said. The surf was massive throughout the week with the Under 17 age and the under 19 and open females being moved to Kirra beach on Friday and Saturday so they could complete in the heats and semis to move back to the main beach at Broadbeach on Sunday for the finals.